ONE. A few weeks ago I took a huge leap of faith and asked my boss if I could go down to part-time at work. It was a momentous decision for me and one that I spent a lot of time thinking about and praying over. If you'll recall, going back to work after I had Mac was hard, but within a few weeks, we fell into a nice routine and we all adjusted very well. Of course I missed him terribly during the day, but I felt like I got a lot of great quality time with him in the evenings and on weekends. I'd take vacation days during the week and we'd spend time together. As he got older (and started sleeping better), it even became easier. We'd meet up for lunch and music class during the workweek. I enjoyed my job and my time away and felt like I was doing pretty well with work/life balance. And then came Mim and turned our world upside down. Going back to work after maternity leave this last time was completely different. I was no longer worried about whether she'd be safe during the day, I was worried about missing out on everything while I was away. I think after the first child I realized how true those cliches are about how fast it all flies by. I blinked and I had a 2 year old - I didn't want that to happen again. She was my last baby...I wanted to soak up every moment I could. Suddenly what little free time I had was now split between two children and I didn't feel like either one of them was getting enough quality time. The more time I spent with them, the more time I wanted with them. I no longer felt like I could handle it all. Whatever work/life balance I had before was completely gone. I felt like I was drowning at work, couldn't concentrate, didn't want to be there. My mind and heart were somewhere else. I started making stupid mistakes at work that I never would have made before and I knew it was only a matter of time before something had to give. So I sucked up my pride and asked for a modified schedule. Honestly, it felt like admitting defeat. I've been stuck in that "I can do/have it all" mentality for such a long time, that it felt like a slap in the face to realize that maybe I can't really do it all. Or maybe I can, but it's not going to all get done well and I'm going to be miserable trying to keep my head above water. Luckily, I have a great boss and work for a company that is willing to let me give this a shot. I'm now 80%, which means I have one day a week (Wednesdays) off to spend with the kids. I'm slightly terrified that this might be career suicide or a slippery slope, but I will admit that it's fantastic! One day a week might not sound like a huge difference, but it's a HUGE difference. It's only been two weeks, but I've already noticed a major improvement in my attitude, patience and stress level at work and home. During my days in the office I can concentrate on my work now and not feel so overwhelmed about missing the kids because I know I have a full day with them all to myself soon. And I've also noticed an improvement in Mac's attitude and feelings towards me. I spent my first day off with him and gave him my full attention all day and that made such a difference in his behavior. Suddenly he was asking for me to give him a bath, not daddy. That hasn't happened in months! I know this was the right move for me and my family. It took me a long time to get here, but I know that no matter what happens with my career, I'll never regret spending this time with my family. TWO. 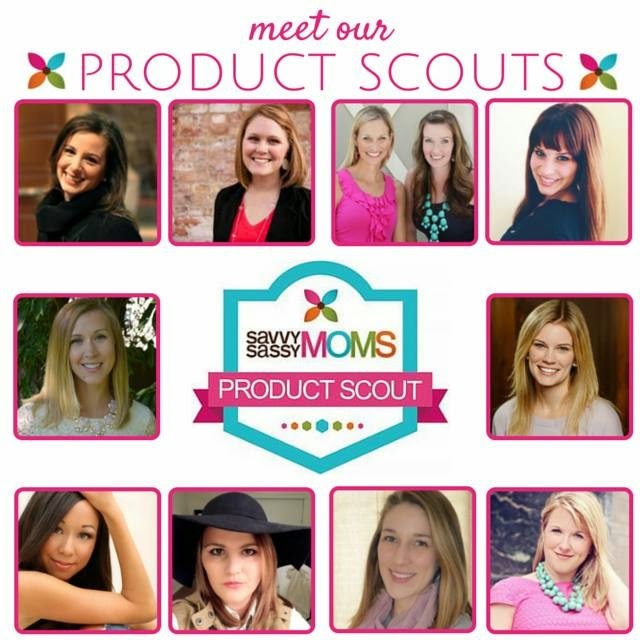 If you follow me on Instagram, you may have seen the announcement that I'm going to be a Product Scout for Savvy Sassy Moms. I'm thrilled to be working with such a great company and an awesome group of moms. I'll be periodically reviewing new baby, kid and family products that I think you'll love, both on the SSM website and this blog. I'll also be participating in some really great giveaways and contests (we just gave away an awesome Joovy stroller), so make sure you're following me on Facebook, Instagram and Twitter for announcements. THREE. In the last week, Mim has turned into an eating machine! She can't shovel the food into her mouth fast enough! She loves everything. Yesterday I gave her a chunk of steak and she chewed/sucked on it for 45 minutes and I had to pry it out of her cold clammy claws to get her out of her high chair. She can take down a strawberry in under a minute. Whole bananas! It's insane! 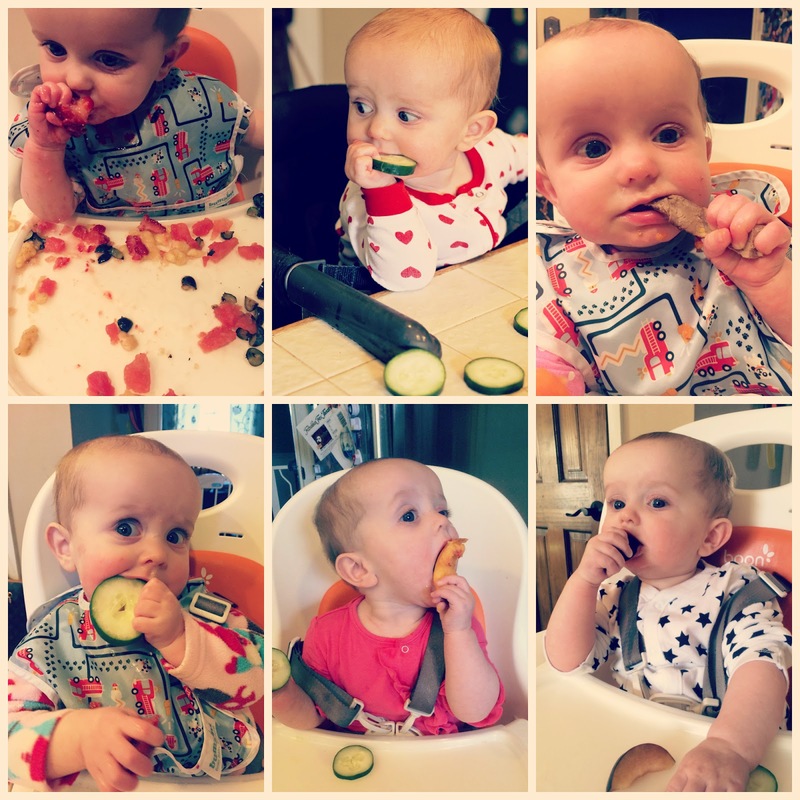 Baby Led Weaning for the win! FOUR. I might be addicted to baby moccasins. Maybe. Is there a support group or something? FIVE. I finally bit the bullet and signed up for Stitch Fix. I know, I know...I'm way late to the party. I blame this on being old and totally not hip any more. So my first box showed up a week ago and it was amazing! I don't know why I waited so long to try this. Polka dots and stripes and pants that actually fit. Consider me impressed. Oh Sara, I am SO happy for you! :) It may feel like you are admitting defeat, I get it, but really, you are just allowing yourself some more of this precious time with your little ones! I think that's an admirable decision and you should be proud! I am struggling with the same feelings now (and the second isn't even here yet! ), so I can only imagine how it feels. So glad you were able to find something that works for you!!!!!!!!!!! Enjoy this time with your CUTIES! OH Sara I'm so happy for you with the part-time thing! I knew when I saw your instagram post that day that this would be great for you - I'm so glad it's working so well! That picture is just the cutest!!! and she looks just like you :) I changed my schedule too after having my daughter, and now I'm expecting #2 and I know it will work much better for us in the long run. You have to do what is right for YOU, your family and those babes. There is nothing wrong in realizing that you want more time with your kids. I say kudos and BRAVO for having the courage to make that hard choice. So happy for you and proud of you! Have a wonderful weekend. I'm so happy about your new job situation and to hear it's going well! Maybe we can meet up one Wednesday this summer at the zoo or something! And congratulations on the new contributor role, that's amazing! I have a new project I totally want to talk to you about too! Happy Friday friend!! Good for you for finding a good work/life balance! So jealous of that! Definitely plan on checking out Sassy Moms! I'm so glad to hear that things are going so well! And just take it from a part-time employee/full-time momma...try and not fill up your day off with appointments. I got into that rut and I realized that my days were typically full of running place to place...and with naptime we weren't getting as much quality time as I hoped. So...I went back to making my appointment's during my working days while I already had childcare and now our days are much more focused on the girls! And I can't wait to put BLW in to practice with Nora...it's going to be super fun, and super messy! 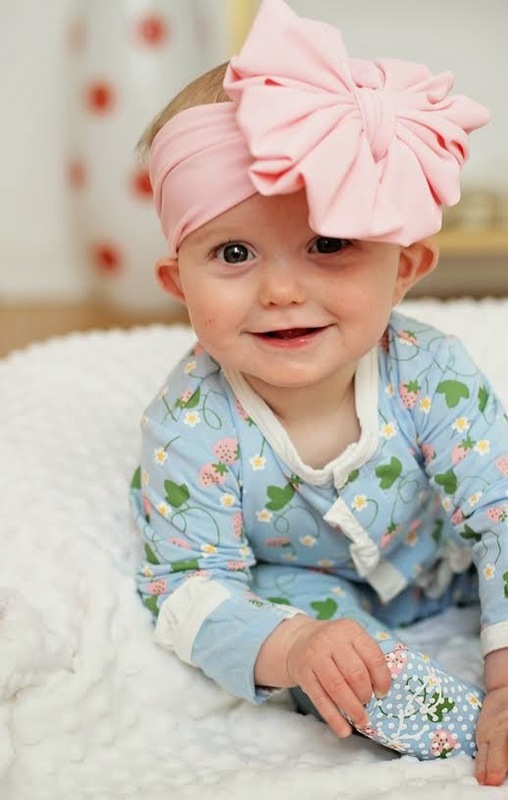 That baby girl and that ginormous bow. LOVE. So glad to hear that working just a bit less has been so rewarding for you! You are rocking the work in mom thing Sara! Oh I'm so happy for you! Being able to find a work/family balance that makes you happier is such a great thing! Enjoy your day off with the kiddos! And I'm late to the party and just signed up for stitch fix too! My first shipment comes Wednesday and I'm so excited! Also nervous I'll like everything and want to keep it all lol! Have a great weekend! Congrats on both asking for the time and getting it!! That's so great!! I'm so glad that it's helping and that you can tell a difference with that small adjustment!! Mim is the cutest little thing (as is Mac), so I don't blame you for not wanting to miss anything!!!! Hooray for being at 80%! I'm sure that extra day makes a huge difference in your sanity and stress. And YAY for trying Stitch Fix! Did you keep anything? How did your stylist do? YAY for 80%!!! I know this is what you've been wanting and just what you and your family needs. Like you said, you will never regret spending more time with your family. YAY for Mim eating all those foods! I love the pictures of her shoving food into her mouth. So stinkin' cute. And YAY for stitch fix! I still haven't bit the bullet but think I need to. I could use someone to style me these days! I'm THRILLED that you have a day off to be with your babes. Way to find a schedule that works for you! That is so awesome that you have one day off now! I'm so happy for you! I too am only in the office 4 days a week and I love it. I had such a hard time coming back to 40 hour weeks after maternity, and so far, it's been much better. I love that Mim is eating so many things! I need to try BLW for baby #2 - I've heard so many good things, but it scares the heck outta me too. I started following your blog partly because I am also an attorney with 2 little ones about the same age as yours. Thank you for being brave enough to ask for part-time hours. I wish there were more part-time opportunities for female lawyers for the exact reasons you described. Attorney hours are so often incompatible with having young kids, but that doesn't mean that young moms can't be great attorneys! Best of luck with your transition! I'm so glad the new schedule is working out for you! I'm sure the kids are loving having you home! I see that Stitch Fix has recently added a maternity line. Might be something I look into. Have a great Monday! I'm so happy for you that you're finding more balance (is that even a real thing?) with work and kids. Kudos to you for asking about going to part time! Looking forwarding to seeing your product reviews -- you always do a great job with sponsored posts!